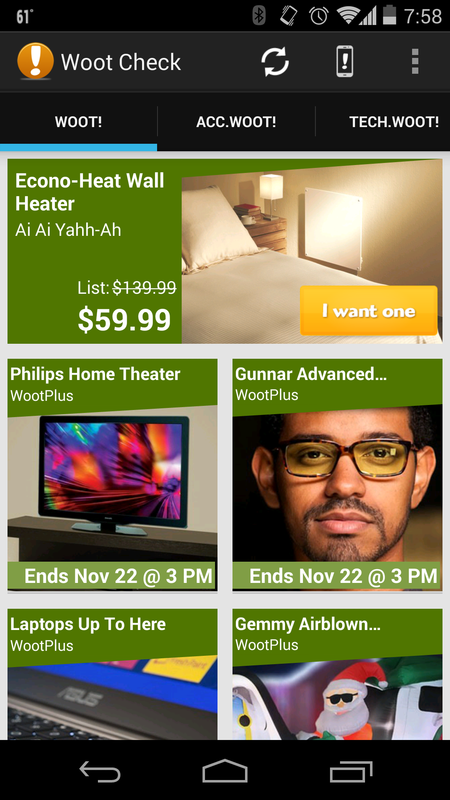 Check daily deals on Woot.com from your Android device. 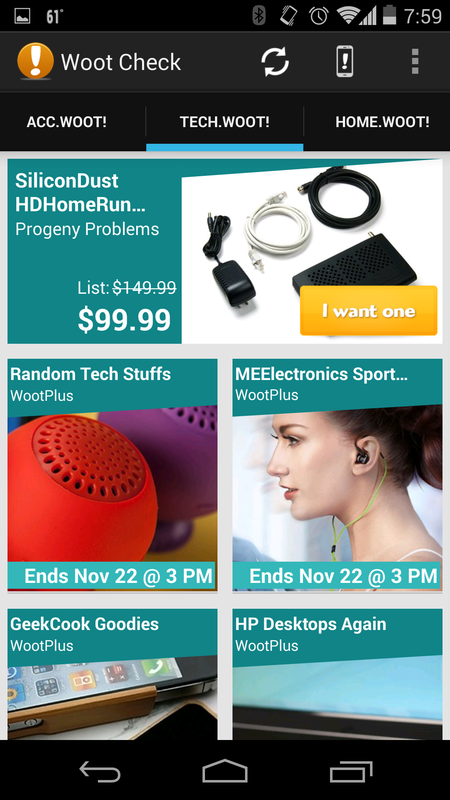 Our easy to use interface makes browsing Woot easier than ever. It's also 100% all natural … and organic! 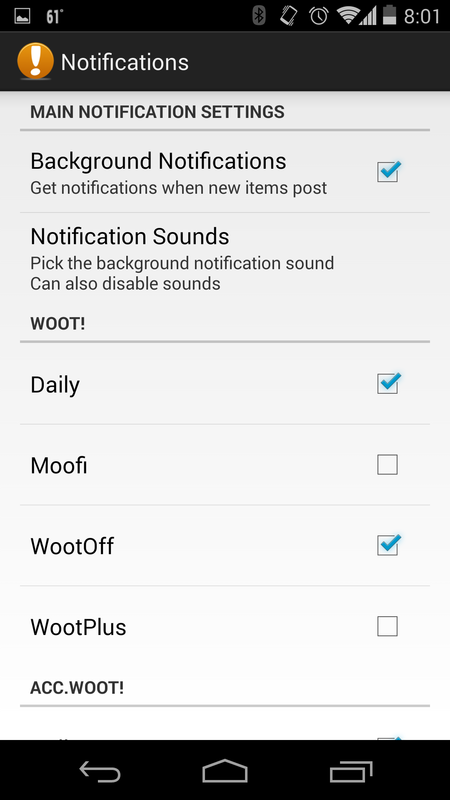 Turn up the volume and enable notifications sounds. We will wake you up at 12:00 AM CST to let you know there is a new Woot. Don't refresh Woot all day long looking for something new. 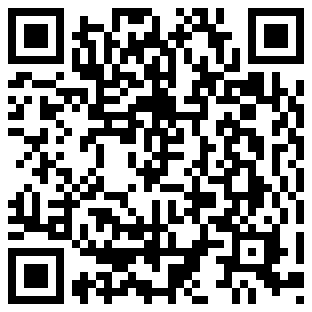 We will do that for you and notify you when we find something. The app is FREE with NO ADVERTISING. 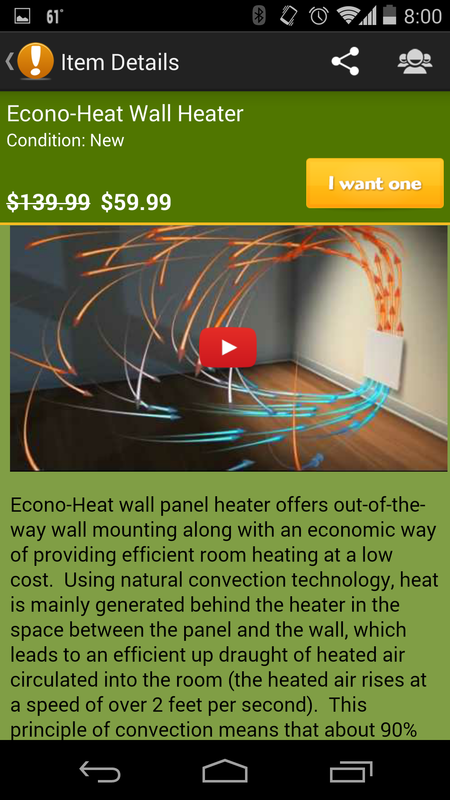 Lets see if Woot can beat that deal! Want one? Why not two? 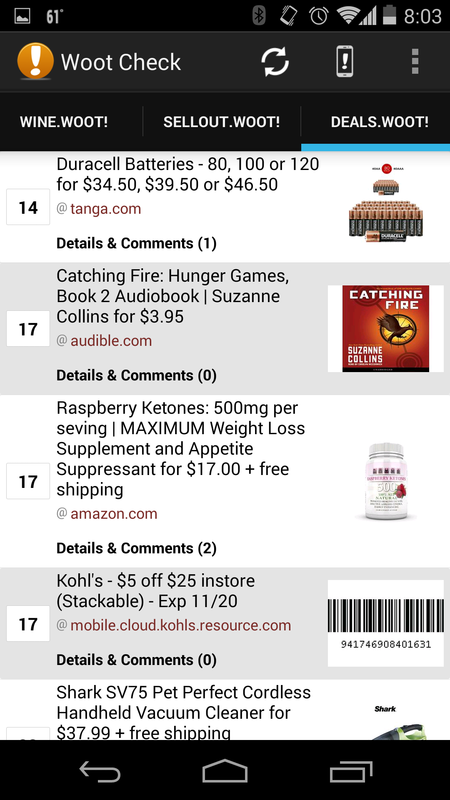 Woot Check allows you to easily watch all of the daily deals on Woot with a clean, easy to use interface. Sites include Woot, Wine, Shirt, Sellout, Kids, Home, and Moofi. We don't think our app is crappy, but it may help you get some. With Woot Check, you just sit back and let us do all the refreshing. 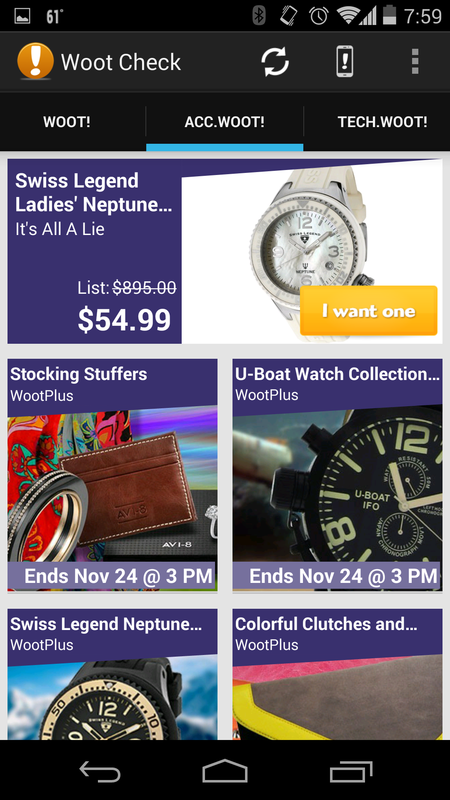 We will show you a notification when a new item posts during a Woot-Off. 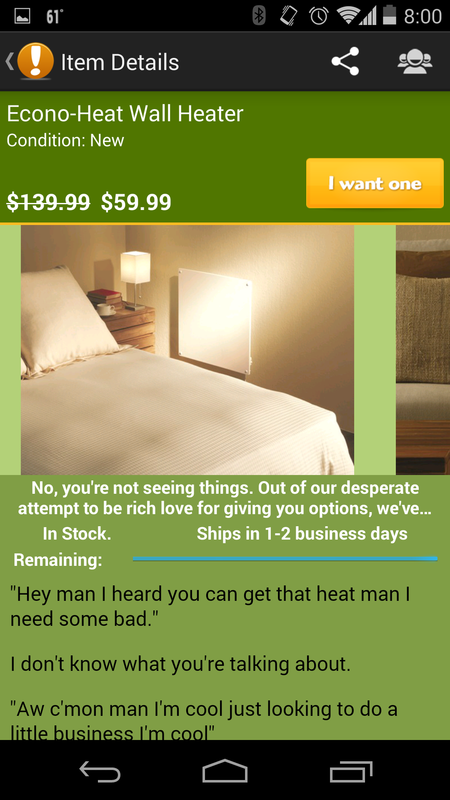 You can even customize the notifications to tell you what the item is and the price! I don't know how you made it this far, but congratulations. It's time to head over to Woot.com and discover something amazing. Side effects may include never being able to fall asleep before 12:00 AM CST. Click the question to reveal the answer! How can I get more information about the item I'm looking at? Click the button in the upper right corner that looks like a page. How do I view the other pictures of the item? Tap on the picture to load the next one. You may also long press on the image and launch it in gallery. This will allow you to zoom and really examine the item. How do I disable or customize notifications? You can do this on the preferences page. You can access preferences by clicking your Menu > Preferences OR there will be a preferences icon in the upper right corner. I want one link does not work! You probably have an ad-blocking application on your device that is blocking the button. Copyright © 2012 GT Media, LLC.